← How to Dispose a Static member? Encapsulation is the act of packing data and function into a single unit. Abstraction means representing the essential features without representing/hiding the background details. 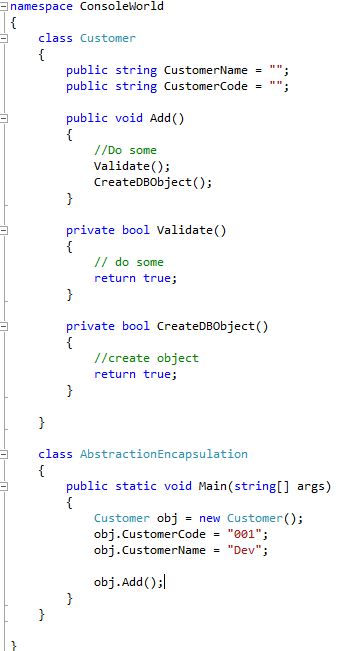 Encapsulation is achieved using abstraction. It is achieved using access modifier. Here if we make Validate() and CreateBDObject() methods public and let the client call these method before calling Add() then it will be showing extra information to user as these two methods will only be called if we want to perform Add operation. So if we follow abstraction then we make these two methods private and include them in Add() method. This way only the essential features are shown to the client and hiding the background details.